Having the resources to capture motor symptoms in various stages of severity throughout the day is a boon for clinical trials. Integrating objective Parkinson’s assessment with telemedicine tools to quantify tremor, measure dyskinesia and assess bradykinesia increases efficiency of workflow for clinical trials. 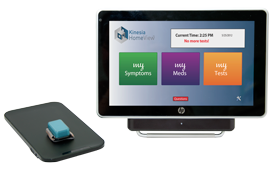 With the HomeView patient kit clinicians measure motor symptom responses to treatments and interventions as transmitted from the patient’s own home. The HomeView patient kit consists of a patient-worn motion sensor and a touch-screen tablet PC programmed to a specific clinical protocol. The wireless ring motion sensor is worn by the patient and connects to the tablet via Bluetooth®. The tablet connects to the Kinesia web application via 3G broadband. The patient-worn motion sensor measures linear acceleration (accelerometers) and angular velocities (gyroscopes) while the patient completes an automated motor assessment. Data is transmitted from the wireless sensor to the tablet using a Bluetooth radio. Objective features are then extracted from the motion sensor data which correlate to Parkinson’s motor symptoms of tremor, bradykinesia, and dyskinesia. Parkinson’s symptoms of tremor, rigidity, and dyskinesia can make plugging and un-plugging small cords and adapters difficult for the intended users. With this in mind we ergonomically designed the system with patient focus groups to integrate wireless data transfer and charging using a pad that sits next to the tablet PC. The touch screen tablet PC provides three major functions including guiding patients through a series of motor assessment tasks, acting as a patient diary, and transmitting data via broadband to the web application. First, whenever it’s time for a patient motor assessment, the tablet alarms and uses videos to guide the patient through an automated symptom assessment. The patient wears the motion sensor and follows videos to complete tasks that were assigned as part of the protocol. During the motor assessments, motion sensor data is wirelessly collected and videos are recorded of the patient. Next, the patient can use the tablet touchscreen interface at various times during the day to complete diary information such as medication and subjective symptom ratings. Finally, after each assessment is complete, the resulting video and kinematic data upload via 3G broadband to the Kinesia web application where previously developed algorithms quantify motor symptoms and then score them on a 0-to-4 severity scale. All recorded data uploads via 3G broadband, provided as part of the package, and is managed through secure, HIPAA-compliant Internet-based storage for analysis, reporting, and backup. 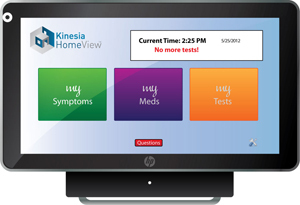 The Kinesia software embedded in to the tablet PC includes a patient diary. When the patient is summoned to complete assessment tasks, they can be prompted to enter their current medication, activity and exercise information.